The La Crescenta Community Garage Sale is this Saturday 3/30 and we are pumped. We know that there is going to be a lot of cool stuff out there waiting to be discovered. The list of stuff for sale runs the gamut. From clothes (lots of clothes) to vintage furniture and bikes, there is bound to be something in the mix that sparks joy for you. The sale begins at 7am in front of the homes on the list. Sellers may start wrapping up by noon, so plan to be early. 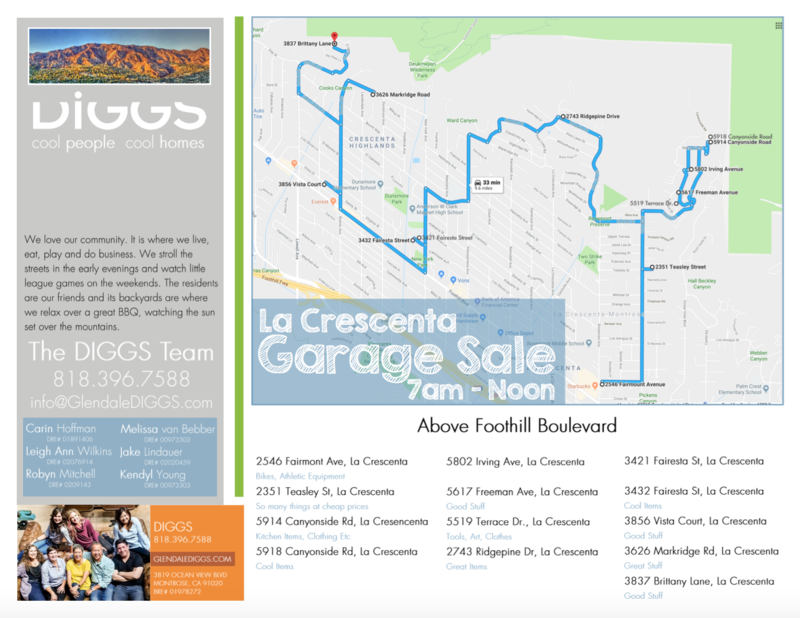 The DIGGS office will be open and you can pick up a map and a donut before you hit the sales. Address is 3819 Ocean View Blvd Montrose, CA 91020. Be sure to drive down Prospect Ave between La Crescenta and Rosemont. One of the homes will have coffee and muffins for sale. Go super early in the morning, as soon as the yard sales start. The good stuff goes fast. Take plenty of cash in small bills — and take more than you think you’ll need. Most sellers won’t take checks. If you find an unexpected treasure, someone else will snag it while you’re hunting for a cash machine. Drive your roomiest vehicle. If you’re hoping to find furniture, consider even pulling a small trailer. Don’t be afraid to haggle when you’d like a lower price. 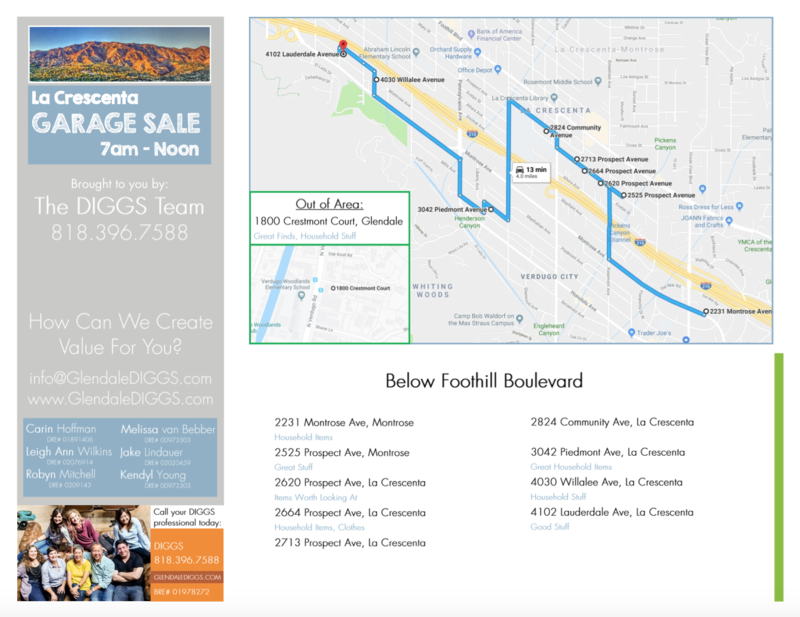 If the seller won’t budge, swing back by later in the afternoon — when the seller is pooped and just wants the La Crescenta garage sale to end. Don’t overlook pieces that just need a little cosmetic work, but do beware of costly repairs that exceed an item’s worth. Imagine how you could use items instead of getting stuck on their original purposes. For example, a piece of iron fencing makes a good alternative headboard or pot rack. You can also reupholster chair seats with the good parts of a damaged rug — or use an old chenille bedspread as a tablecloth. Don’t buy something if you can’t figure out how to use it. You want to find treasure, not more clutter that just gets in your way. To read more tips on La Crescenta garage sale shopping check out this great article. © 2013 - 2015 DIGGS. All rights reserved. If you'd prefer that we can you to confirm your request at a specific time, enter it here. No guarantees, but we'll do our best. How Can I get More Profit? You might only need to declutter, or you might need a little maintenance. Every home is unique, so we need to see what you have, and find out what works for you. We'll give you great information and no sales hype- ever. Please confirm that this address is valid.